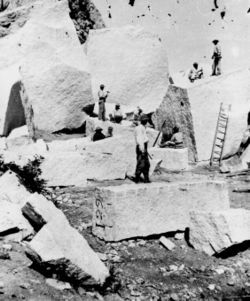 Quarrying granite for the Mormon Temple, Utah Territory. The ground is strewn with boulders and detached masses of granite, which have fallen from the walls of Little Cottonwood Canyon. The quarrying consists of splitting up the blocks. Granite ( IPA: /ˈgranɪt/) is a common and widely occurring type of intrusive, felsic, igneous rock. Granites are usually a white, black or buff colour and are medium to coarse grained, occasionally with some individual crystals larger than the groundmass forming a rock known as porphyry. Granites can be pink to dark gray or even black, depending on their chemistry and mineralogy. Outcrops of granite tend to form tors, rounded massifs, and terrains of rounded boulders cropping out of flat, sandy soils. Granites sometimes occur in circular depressions surrounded by a range of hills, formed by the metamorphic aureole or hornfels. Granite is nearly always massive, hard and tough, and it is for this reason it has gained widespread use as a construction stone. Figure 1. QAPF diagram of granitoids and phaneritic foidolites (plutonic rocks). Granite primarily consists of orthoclase and plagioclase feldspars, quartz, hornblende, muscovite and/or biotite micas, and minor accessory minerals such as magnetite, garnet, zircon and apatite. Rarely, a pyroxene is present. Very rarely, iron-rich olivine, fayalite, occurs. 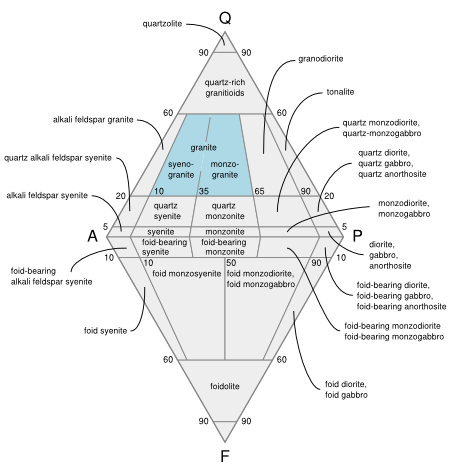 Granite is classified according to the QAPF diagram for coarse grained plutonic rocks (granitoids) and is named according to the percentage of quartz, alkali feldspar (orthoclase, sanidine, or microcline) and plagioclase feldspar on the A-Q-P half of the diagram. Granite-like rocks which are silica-undersaturated may have a feldspathoid such as nepheline, and are classified on the A-F-P half of the diagram (Figure 1). True granite according to modern petrologic convention contains both plagioclase and alkali feldspars. When a granitoid is devoid or nearly devoid of plagioclase the rock is referred to as alkali granite. When a granitoid contains <10% orthoclase it is called tonalite; pyroxene and amphibole are common in tonalite. A granite containing both muscovite and biotite micas is called a binary or two-mica granite. Two-mica granites are typically high in potassium and low in plagioclase, and are usually S-type granites or A-type granites. Granite is currently known only on Earth where it forms a major part of continental crust. Granite occurs as relatively small, less than 100 km² stock-like masses and as large batholiths often associated with orogenic mountain ranges and is frequently of great extent. Small dikes of granitic composition called aplites are associated with granite margins. 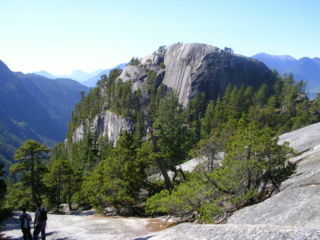 In some locations very coarse-grained pegmatite masses occur with granite. Granite has been intruded into the crust of the Earth during all geologic periods; much of it is of Precambrian age. Granite is widely distributed throughout the continental crust of the Earth and is the most abundant basement rock that underlies the relatively thin sedimentary veneer of the continents. Despite being fairly common throughout the world, the areas with the most commercial granite quarries are located in the Scandinavian Peninsula (mostly in Finland and Norway), Spain (mostly Galicia and Asturias), Brazil, India and several countries in the South end of the African continent, namely Angola, Namibia, Zimbabwe and South Africa. Granite is an igneous rock and is formed from magma. Granite magma has many potential origins but it must intrude other rocks. Most granite intrusions are emplaced at depth within the crust, usually greater than 1.5 km and up to 50 km depth within thick continental crust. The origin of granite is contentious and has led to varied schemes of classification. Classification schemes are regional; there is a French scheme, a British scheme and an American scheme. This confusion arises because the classification schemes define granite by different means. Generally the 'alphabet-soup' classification is used because it classifies based on genesis or origin of the magma. This process operates regardless of the origin of the parental magma to the granite, and regardless of its chemistry. However, the composition and origin of the magma which differentiates into granite, leaves certain geochemical and mineralogical evidence as to what the granite's parental rock was. The final mineralogy, texture and chemical composition of a granite is often distinctive as to its origin. For instance, a granite which is formed from melted sediments may have more alkali feldspar, whereas a granite derived from melted basalt may be richer in plagioclase feldspar. It is on this basis that the modern "alphabet" classification schemes are based. A-type or anorogenic granites are formed above volcanic "hot spot" activity and have peculiar mineralogy and geochemistry. These granites are formed by melting of the lower crust under conditions that are usually extremely dry. The granite caldera of Yellowstone National Park is an example of an A-type granite. The granitization theory states that granite is formed in place by extreme metamorphism. The production of granite by metamorphic heat is difficult, but is observed to occur in certain amphibolite and granulite terrains. In-situ granitisation or melting by metamorphism is difficult to recognise except where leucosome and melanosome textures are present in gneisses. Once a metamorphic rock is melted it is no longer a metamorphic rock and is a magma, so these rocks are seen as a transitional between the two, but are not technically granite as they do not actually intrude into other rocks. In all cases, melting of solid rock requires high temperature, and also water or volatiles which act as a catalyst by lowering the solidus temperature of the rock. The problem of emplacing large volumes of molten rock within the solid Earth has faced geologists for over a century, and is not entirely resolved. Granite magma must make room for itself or be intruded into other rocks in order to form an intrusion, and several mechanisms have been proposed to explain how large batholiths have been emplaced. The Red Pyramid of Egypt (c. 26th century BC), named for the light crimson hue of its exposed granite surfaces, is the third largest of Egyptian pyramids. Menkaure's Pyramid, likely dating to the same era, was constructed of limestone and granite blocks. The Great Pyramid of Giza (c. 2580 BC) contains a huge granite sarcophagus fashioned of "Red Aswan Granite." The mostly ruined Black Pyramid dating from the reign of Amenemhat III once had a polished granite pyramidion or capstone, now on display in the main hall of the Egyptian Museum in Cairo (see Dahshur). Other uses in Ancient Egypt, include columns, door lintels, sills, jambs, and wall and floor veneer. How the Egyptians worked the solid granite is still a matter of debate. Dr. Patrick Hunt has postulated that the Egyptians used emery shown to have higher hardness on the Mohs scale. Many large Hindu temples in southern India, particularly those built by the 11th century king Rajaraja Chola I, were made of granite. In fact, the amount of granite in them is comparable to the Great Pyramid of Giza. Granite has been extensively used as a dimension stone and as flooring tiles in public and commercial buildings and monuments. With increasing amounts of acid rain in parts of the world, granite has begun to supplant marble as a monument material, since it is much more durable. Polished granite has been a popular choice for kitchen countertops due to its high durability and aesthetic qualities.